Sun., 18 Aug. - Tue., 20 Aug. 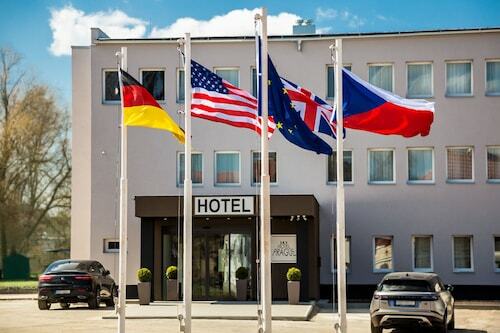 Located near the airport, this family-friendly hotel is within 9 mi (15 km) of Divoka Sarka, Prague Castle, and Charles Bridge. St. Vitus Cathedral and Royal Route are also within 9 mi (15 km). 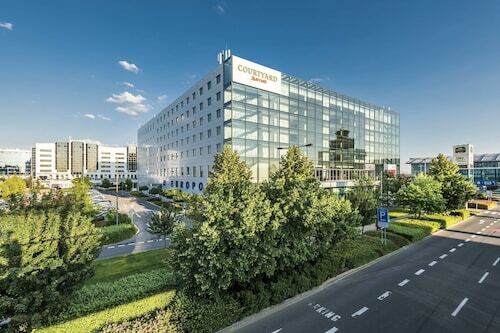 Located in Prague 6, this hotel is within 9 mi (15 km) of Divoka Sarka, Prague Castle, and Charles Bridge. Astronomical Clock and Old Town Square are also within 9 mi (15 km). 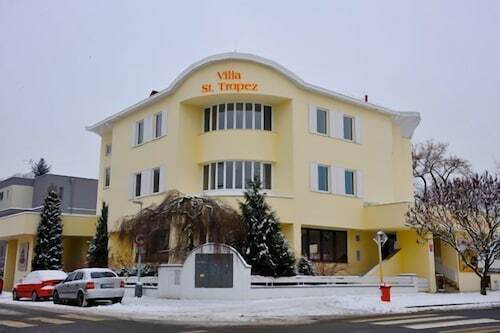 Located in Prague 6, this hotel is 1 mi (1.7 km) from Divoka Sarka and within 6 mi (10 km) of Prague Castle and St. Vitus Cathedral. Strahov Monastery and Royal Garden are also within 6 mi (10 km). 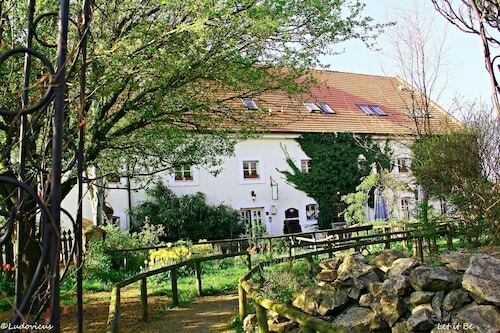 Located in Prague-West District, this hotel is within 9 mi (15 km) of Divoka Sarka, Prague Castle, and St. Vitus Cathedral. Royal Garden and Letna Park are also within 9 mi (15 km). Located in Prague 6, this hotel is 1.4 mi (2.3 km) from Divoka Sarka and within 6 mi (10 km) of Prague Castle and St. Vitus Cathedral. Strahov Monastery and Petrin Hill are also within 6 mi (10 km). Prague-Ruzyne Station is 6 minutes by foot. Located in Prague-East District, this hotel is 0.2 mi (0.3 km) from Divoka Sarka and within 6 mi (10 km) of Prague Castle and Charles Bridge. Astronomical Clock and Old Town Square are also within 6 mi (10 km). Located in Prague 6, this hotel is 1.1 mi (1.8 km) from Divoka Sarka and within 6 mi (10 km) of Prague Castle and St. Vitus Cathedral. Strahov Monastery and Petrin Hill are also within 6 mi (10 km). Prague-Ruzyne Station is 6 minutes by foot. Located in Prague 6, this hotel is 0.9 mi (1.4 km) from Divoka Sarka and within 6 mi (10 km) of Prague Castle and Astronomical Clock. Charles Bridge and St. Vitus Cathedral are also within 6 mi (10 km). Prague-Ruzyne Station is 11 minutes by foot. Question : How long do most people stay in Prague? Answer : Of course, you are not most people, but if you were, you'd stay roughly three days. Question : How long is the flight from BUD to PRG? Answer : CSA can take you there in one hour and 10 minutes. For example, if you were to leave Budapest at 7:50 PM CEST, you would arrive in Prague at 9:00 PM CEST. Giving you enough time to catch up on your work before your plane touches down. Answer : When you’re flying from BUD to PRG, the day with the most flight times is Monday, with five different options. The day of the week with the fewest number of options is Thursday with only three different departures. Question : Which airline has the least delays from Budapest to Prague? Answer : Booking with CSA means you will arrive to Prague approximately the time you were supposed to. In fact, this airline has a 78% average for getting there on time. Question : What is the cheapest date to fly to Prague? Answer : If you are wanting to save some money, look at May 3rd. As of Apr 22nd, it's showing the cheapest ticket at $128. That is 36% below the average price for this route, so you can spend your savings on an adventure rather than the flight. Question : What is the cheapest airline flying from Budapest to Prague? Answer : CSA is the leader in keeping costs down for their passengers over the next three months. Fares are being booked at just $128, which is quite a deal when compared to the more expensive bookings of $433. Answer : The cheapest day to fly from Budapest to Prague is on Monday. If you would like to save a bit of cash on your next business trip look for flights on Monday. Good flight. On time and good staff.